Transubstantiation is alright I suppose, but why should words have all the fun? How was medieval and Byzantine Eucharistic theology expressed visually? Alongside ASCHA President James Romaine, I have organized a symposium to explore that question at the Art Institute of Chicago (details at the AIC site), and it's less than a month away. Our keynote speaker for "Envisioning the Eucharist" is the University of Chicago's medieval art history superstar Aden Kumler, whose book Translating Truth got us going in this direction, to say nothing of the amazing Ann Astell. Envisioning the Eucharist will be a nice way to extend the current Art and Appetite exhibition, and it certainly goes well with the AIC painting that would surely have cured Cameron's existential crisis, Maurice Denis' Easter mystery, where the Eucharist is dispensed by a tree. 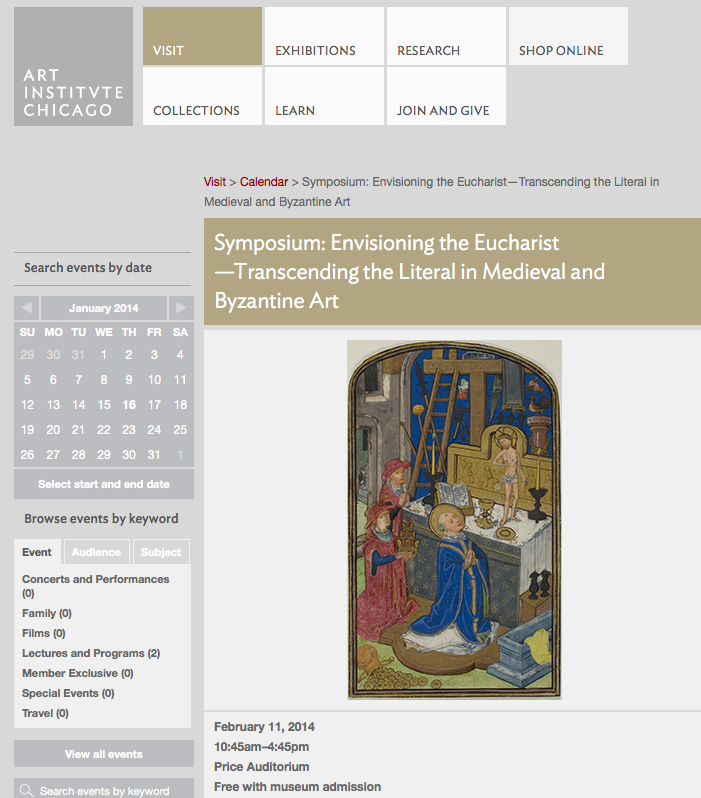 Our conference also follows on the heels of an exciting Morgan Library exhibition on the Eucharist in Medieval Life and Art, the art historically rich publication of A Companion to the Eucharist in the Middle Ages, and (eh hem), my paper that examines eucharistically-inspired Marian masculinity freshly posted at the U of C Div School. But the symposium explores aspects that each of these venues did not. Registration for this event, furthermore, is absolutely FREE with admission to the Art Institute (pretty rare for these kinds of things). All you have to do is email drjamesromaine@gmail.com The whole College Art Association will be in Chicago that week though, so please do so soon. There's more to the Last Supper than Leonardo's literalism!